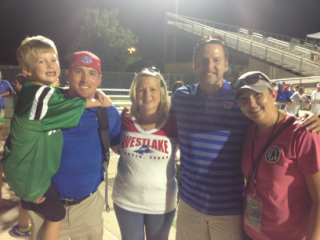 Mom, Dad, Sister, Nephew and I after the Southlake Game. I'm so excited to be starting my third year in the Westlake Community and Westlake High School. This is my 8th year teaching math, and I have taught Algebra I, Geometry, Math Models, and Algebra II. I spent my first four years in the Dallas area at Colleyville Heritage High School, and I have spent two years at Marble Falls High School. I'm a Texas State graduate, and also spent some time at Southern Methodist University in Dallas. I made my way to Westlake High School with the Head Football Coach, Todd Dodge. Coach Dodge coached me when I was in high school at Southlake, and I have coached with him for the last four years. As I said before I'm very excited to working with your students here at Westlake, and I'm looking foward to teaching, collobarating, and developing relationships with your students. If there is anything you need from me please feel free to call or email me at any time. TI 84 Plus calculator. It has many additional features which will be useful during your SAT, and ACT tests.